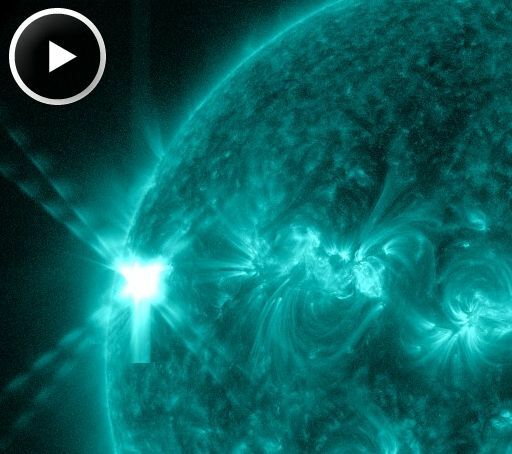 Sun produces four X-class flares in two days | Watts Up With That? Although the sunspot is not directly facing Earth, this flare might have produced a CME with an Earth-directed component. We are waiting for coronagraph data from SOHO and the twin STEREO probes to check this possibility. Stay tuned for updates. In summary, AR1748 has produced an X1.7-class flare (0217 UT on May 13), an X2.8-class flare (1609 UT on May 13), an X3.2-class flare (0117 UT on May 14), and an X1-class flare (0152 on May 15). These are the strongest flares of the year, and they signal a significant increase in solar activity. 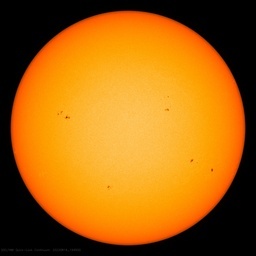 Solar activity on the upswing, big sunspot rotating into view is producing x-class solar flares. Large CME expected soon, may hit earth. If you have ever paid much attention to water boiling in a pot, you may have noticed that when you allow it to cool down from a hard rolling boil the bubbles get larger. I think this is because the turbulence decreases and the bubbles are able to adhere to the bottom of the pot and grow before detaching. I wonder if we are seeing a phenomenon like this with the sun. Turbulence is decreasing and the flares get larger. I thought a watched pot never boils, so I don’t watch. Interestingly, after a fairly cool spring, with wide spread record breaking cold temps the past week, we are seeing a massive heatwave coming a few days after these massive solar flares. 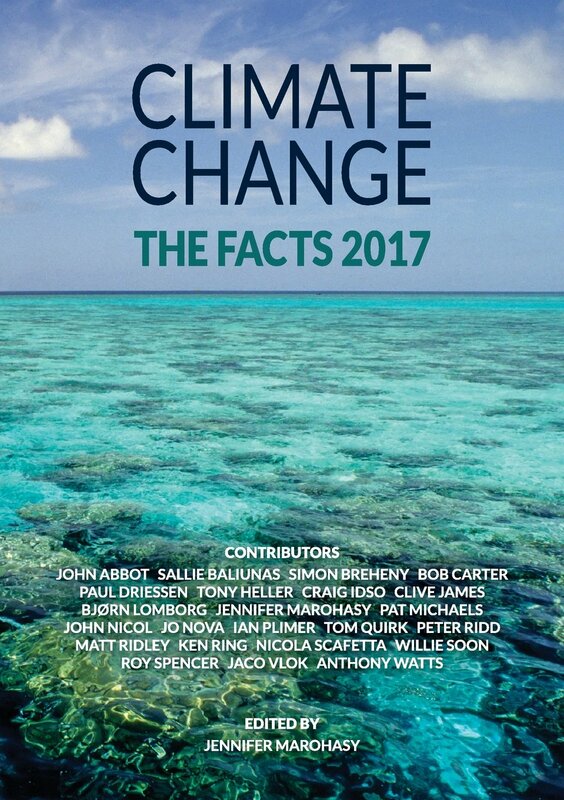 Or could it be that fluctuations of energy coming from that big giant orb of energy up there in the sky, has a greater affect on Earth’s temps than a 1/100th of 1% increase of the level of CO2 in the atmosphere? Well l hope these flares help to push the jet stream northwards here in the UK. Otherwise it looks like we are in for a other cool wet summer. So does this mean that if we stop watching the sun it’ll boil? Oh my God it’s worse than we thought and it’s All Our Fault! Massive, just “massive” I tell you! Dell from Michigan says:	Interestingly, after a fairly cool spring, with wide spread record breaking cold temps the past week, we are seeing a massive heatwave coming a few days after these massive solar flares. 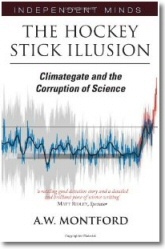 Should be interesting to see whether there is any detectable influence in Arctic ice coverage. A strong event after a quiet start may show something if there’s a linkage. Dell from Michigan – it’s a bit more complicated than that. Here in London the temperature has plunged and we’re back to winter temperatures after a week of warm sunny spring. So yes, coincidence. If anyone is interested, you can receive notice of such events in real time. Has anyone notice over the past few days a phenomenon when the sky is cloudy the clouds seem to glow an intense greyish-yellow color? I’ve only seen this during years when solar maxim is occurring or when large Flares occur. Here’s is a heliocentric view of the solar system from May 15, about the time the X-class flares took place, to give an Idea of the direction. This is what I have been working on, the orange line is a plot with physical parameters. Interestingly, after a fairly cool spring, with wide spread record breaking cold temps the past week, we are seeing a massive heatwave coming a few days after these massive solar flares.. Pretty much same here east central Wisconsin. Joke in these parts is.. from Winter to Summer again.. If Dr. S. is lurking, some good articles left over on the “Open Thread Sunday” thread. (related to northpole, north magnetic pole, north geomagnetic pole etc..) might could be some good extracurricular reading for you, with your background already..just want to make sure you stay rounded and diverse. Did the Voyager 1 get shrunk out of the heliosphere bubble twice? How much do the boundaries fluctuate during minimum periods such as this? Are the hard X-ray flares recorded in the TSI? The energy of these flares would pass through most detectors without being recorded. The TSI reading are sufficiently detailed that these flares should show as some sort of spike in the readings. Are the hard X-ray flares recorded in the TSI? Solar coronal mass ejections – CMEs (accompanying a flare) in the even-numbered solar cycles (as is current one SC24) tend to hit Earth with a leading edge that is magnetized north. Such CMEs open a breach and load the magnetosphere with plasma starting a geomagnetic storm. In that respect the Earth’s magnetic field response to the even and odd numbered cycles is slightly different. Does this matter? maybe, maybe not. Is the LOD change caused by solar activity? known unknown . I inserted ‘b’ instead of ‘i’. my apologies. Ms C, you are a mischievous lady. I’d be interested to know into how much extra ionising radiation on earth (milliSievert) this translates. Not that I am affraid of it, but it’d be nice to know for instance how this compares for instance to the fallout of Hiroshima or other large radiation events. 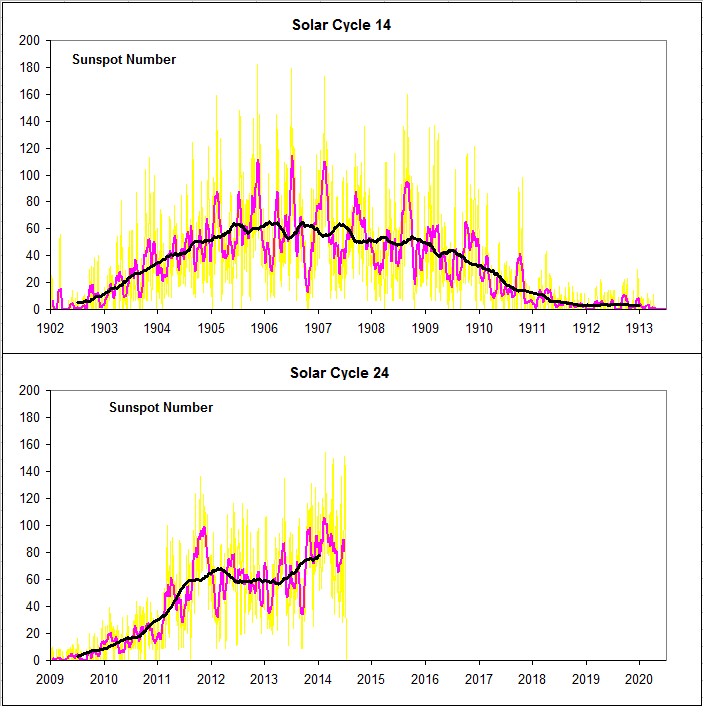 I recall the high solar peak(s) in the mid to late 1950s. We used Motorola mobile phones with a squelch in our pickups to reach the base station. I was an electrical troubleshooter in the West Texas oilfields. When we would have a lightening storm, the trouble calls would start coming in from throughout the Permian Basin. The dispatcher would give you a list of 4 or 5 problems to start on in a general area. When you had the electricity back on and the wells back to pumping, you would normally call in to get more problems to fix, but the static was so bad in the late 1950s that you had to go somewhere and use a land phone to call back in if you were much over 10 to 20 miles away. Blown up transformers were fairly common. The shielding is much better these days so I wouldn’t expect as many difficulties as then, but the problems lasted a few years and were a real nuisance. The temperatures would go above 105F in summer for several days in a row. In normal times the summertime temperatures would be 102-104 F peak. We are in the same part of the PDO cycle currently as we were back then. We attributed the hot summers to the sun in those days since we knew nothing about PDO or other natural cycles. I wish one of them could get politicians to see the light. Hekla, Elbrus, etc concern me more. From reading your answer; I gather that they are not recorded. The GOES15 data could be added to make the record complete. I realize that they are small compared to the total energy coming from the Sun, but to make the record complete, they should be included. I asked the question because I could not see any indication of flare energy in the TSI traces. That’s usually occurs before severe thunderstorms. Green and purple shades can also be seen sometimes. starting a geomagnetic storm. In that respect the Earth’s magnetic field response to the even and odd numbered cycles is slightly different. I could not see any indication of flare energy in the TSI traces. Since 1905 there were 5 odd numbered cycles (15, 17, 19, 21 &23) and say 5 even cycles (1/2 of each 14 and 24, then 16, 18, 20 & 22). which makes it on average 18% more storms during even than odd cycles. Since both SC14, and SC24 are the weakest cycles in the period, one could take a rough rule that since 1905 we had 20% more geomagnetic storms during even cycles. 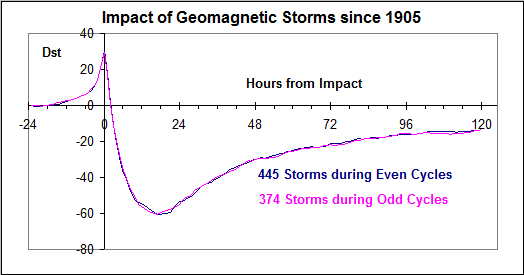 During even cycles (more storms and stronger solar pressure on the magnetosphere) LOD increases up to 0.5ms, i.e. Earth’s rotation slows down and vice versa, during odd cycles (less storms and less solar pressure on the magnetosphere) the LOD decreases by 0.5ms, i.e. Earth’s rotation accelerates. From my link above it can be seen that rotation acceleration and de-acceleration starts with the SC maxima. Solar induced ring currents’ magnetic field acts as a magnetic brake on the Earth’s rotation rate ! Perhaps a mechanism not known previously ? p.s. it was 5cm of snow today in the west of England. Nonsense, it is an excellent proof of confirmation bias. A CME always causes a magnetic storm, no matter what the cycle and what the polarity. The Sun was just a bit more active in even cycles which influences the number of CMEs. The Earth’s response to a CME is the same in even and odd cycles as the Figure shows. Just when you thought it was safe to go back into the magnetosphere, Old Sol throws four X-treme e-missy fits in a row! He does seem to have a flare for that, doesn’t he? No logic there, just false assumptions and wrong physics. A watched pot never boils but an unwatched pot boils over. So let’s all keep an eye on the sun shall we. You can find newer data for both lists on the web if you want to [I did that for the Figure]. 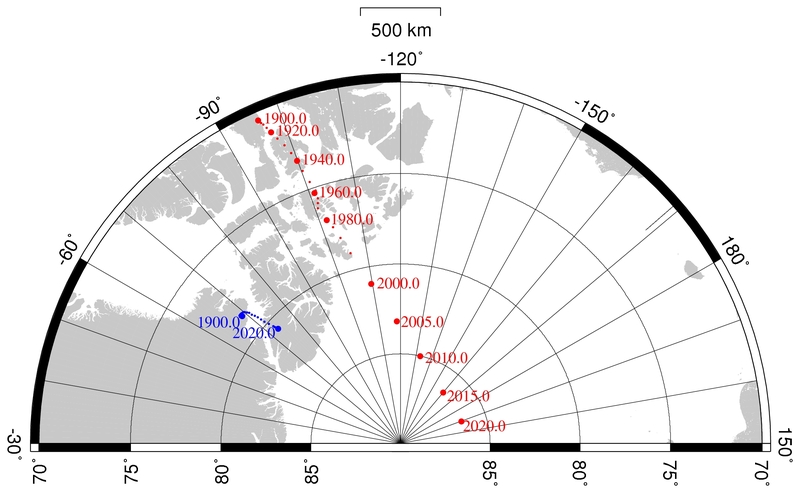 You can find out how geomagnetic activity works here: http://www.leif.org/research/NASA-SP366.pdf [big]. The paper is 40 years old, but nothing has really changed. I occasionally look at it, but I am slow learner. I put the typeset published version on the site now. Try that. It is easier to read and better suited for slow learners. Look at page 133ff on Geomagnetic storms. Thinking back on my children, I note that low motivation is often the excuse for slow learning. Perhaps try to be a bit more motivated. I signed up for the Spaceweather.com Text Alert for X-Class Flares. Might give me time to put the vulnerable comm devices in the metal safe or my garbage can faraday cage vault. Thinking back on my children, I note that low motivation is often the excuse for slow learning. Perhaps try to be a bit more motivated. …exchanges like these are why I keep coming back to WUWT time and again! Thanks, Lief! ….or you’ve got nothing better to do. perhaps Dr.S can elucidate so your visit was even more rewarding. SC24 is heading for the second peak. Yesterday NOAA’s daily count was 186 (SIDC equivalent around 130) , if I am correct, that would be the highest since 2011/11/09, when the daily NOAA count was 208. This is because the magnetic pole is determined by small-scale features of the magnetic field. These fall off so strongly with altitude that they are not present in the magnetosphere where the aurorae come from. I think you spoke too soon the temperature has just started to shoot up! For 1905 to 2012 sum of all SSN annual numbers for odd cycles appears to be about 13% greater than the sum for even cycles, while the number of geomagnetic storms is reverse with 18% difference. I think this is important. Leif, do you have an opinion on planetary secular resonance having an effect on the solar dynamo causing a possible solar tachocline induction? http://www.leif.org/research/Even-Odd-Dst.png so you can stop speculating. Now, take the opportunity to learn. Is from a press release dumbed down beyond the facts. There is no ‘breach’. The magnetosphere is open at all times and the solar wind is magnetically connected to the Earth’s field at all times somewhere on the magnetosphere [proof of this is that the Svalgaard-Mansurov effect is always present]. There is no such effect. Can there be an effect on the suns magnetic fields interacting with secular resonance? Again, no, in particular on the Sun: the solar wind is supersonic and magnetic effects cannot travel upstream. As the graph clearly show, yes. What is wrong with this is the reliance on wiggle matching. There are good physical reasons why the solar polar fields area good predictor of solar activity and based on those, solar activity will not have a late cycle major surge. There will, of course, be wild swings [like in cycle 14]. We are seeing one right now, and there will be more. I’ve found what appears to be a match between a secular resonance of the planetary orbits and the sunspot record from 1800’s – 2012, but it may be something else, I’m trying to rule out possibilities. Before I strike secular resonance of my list, can it effect the solar wind? @ Leif: SC24 doesn’t seem to have such wild swings as SC14. Activity varies a lot but not like SC14. SC14 even had spotless days during its solar max. SC24 doesn’t seem to have such wild swings as SC14. Activity varies a lot but not like SC14. SC14 even had spotless days during its solar max. Especially the rule that is R is between 0 and 7 [e.g. 1] then it is set to 7. Comparing cycles isn’t really science but sometimes nice to do. What do you think about SC12 vs SC24. Those look more the same to me than SC14 and SC24. I can see that there are 2 observers using the original wolf telescope, do you know who they are? Just one last question: any new info on the Locarno wolf count? As you note, this is hardly science, especially when we only have a piece of a cycle. Yes, Locarno now keeps a count both of weighted spots [as they have done since 1957] and of the raw, unweighted [real] count. The result is still the same: weighting increases the sunspot count by 58%, translating into an inflation of the SSN by almost 20%. Have you done any research into secular resonance? As in “Orbital resonance”, like I mentioned above, I’ve been working on the idea of this and I have built a physical plot to visualize it, I haven’t finished it yet, I would like you to have a look at it when completed. It may not be what I think it is, I’m thinking in the way of Orbital resonance ‘possibly’ interacting with magnetic fields. The formula I have come up with for this is N = n1-n2. I’ll have more in a day or two. Orbital resonance is a well-researched and well-understood phenomenon and every astronomer has basic knowledge of the process. Planets, moons, and planetary rings all show examplea of such resonances. I’m thinking in the way of Orbital resonance ‘possibly’ interacting with magnetic fields. That is hard as the magnetic field varies on time-scales MUCH shorter than orbital resonances. Furthermore, magnetic effects cannot travel upstream in the solar wind so cannot influence the sun. Yes, but can the Sun be influencing The orbital resonance of the planets, I’ll be able to explain it better when I have finished, I’ll provide the data. there seems to me to be an interaction, maybe you could shed some light on it. Like I said, it may be nothing, but It would be great to have an explanation. No, I don’t think so, at least not on reasonable time scales. As the sun slowly loses mas [4 million tons per second], over billions of years there will be an effect on the orbits, but we don’t need to worry about those.